« …AND ON THE DRUMS – GUNSON! Webcon has announced that its DCOE mesh filters are now back in production. almost no restriction to airflow. Fitting takes only a matter of seconds and the only maintenance required is periodic cleaning. They add no more than 20mm to the end of the air horn, so you can be assured of the very finest filtration in the tightest of spaces. 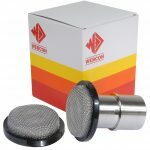 Available now on 01932 787 100 or visit www.webcon.co.uk ENDS. Print article This entry was posted by admin on November 2, 2018 at 10:39 am, and is filed under News. Follow any responses to this post through RSS 2.0. Both comments and pings are currently closed.